In the strange way that time passes, particularly in the world of tech, the 2014 Design Automation Conference is already feeling like ancient history. Was it really just last month that the Moscone Center exhibit hall was crammed with essentially all of major players in EDA? Whether or not you were there, you’re forgiven if you haven’t thought about DAC in the weeks since. In the last few weeks, the tech beat has continued to serve up big stories, including Amazon’s phone and Google’s Android everywhere announcements. It’s also the season of summer vacations. Oh yeah, and there was the small matter of a soccer tournament in Brazil. In the years before I joined the DAC executive committee I often stopped thinking about DAC soon after leaving for the airport to head home to Portland. Not that it hasn’t always been a great show. It’s just that as is true for most attendees, the demands of my various day jobs always started to loom after several days away. This year and next, forgetting DAC is not an option for me because I’m the incoming general chair of next year’s conference. That is, in a very real way, DAC 52 is my job (or at least my second job), for the next 11 months. Case in point are my week 4 and week 5 posts, in which I tried to string together a few comparisons between DAC and the World Cup, the latter of which I know nearly everyone has been thinking about for the last few weeks. (As a German fan still reveling in Sunday’s result, I figure I’m entitled to more than a bit of Fussball talk.) Besides, even in Brazil, there were more links to our industry than you might think. 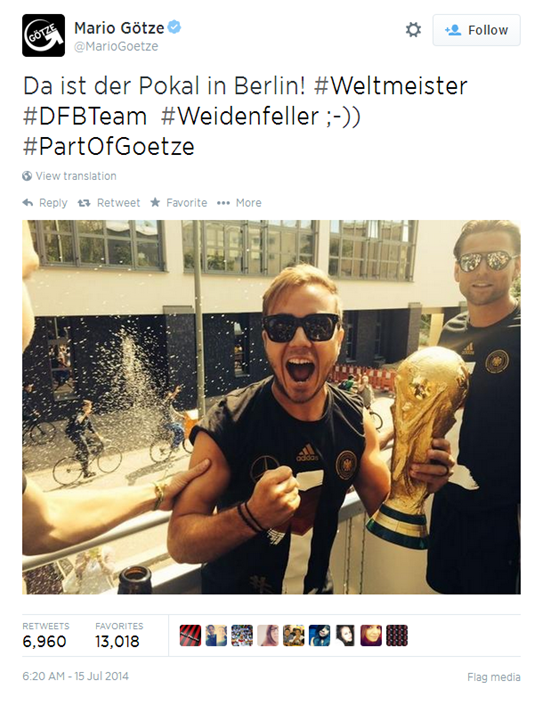 German midfielder Mario Götze with the FIFA World Cup Trophy, from his Twitter feed. I’ll ask EDA Cafe readers the same question I’ve posed to my colleagues in the industry via casual conversations, emails, phone calls and the DAC site: What would you like to see at next year’s conference? Post a comment here or send a note through DAC.com. I promise to read and respond to each one. With your permission I might even use your thoughts as a topic for a future blog. Social media is best for conversation, I know, and not for one-way communication. I’m just blogging for now but I might well try out other social services, including Twitter. And while I know I’m unlikely to garner as many followers as Mario Goetze, I do hope to hear from at least a few of you who are already looking beyond this summer. The next World Cup may still be four years away but DAC 52 will be here before you know it. This entry was posted on Wednesday, July 16th, 2014 at 3:22 pm. You can follow any responses to this entry through the RSS 2.0 feed. You can leave a response, or trackback from your own site.